I often marvel at how little patience I have generally, but when it comes to baking and cooking, I'll happily spend hours in the kitchen fussing over the smallest, most intricate details! Mix until well combined. Depending on the type of ground almostyou're using, the mixture may look a little dry, if so add another tsp of water. You're looking for a firm dough. Once chilled, roll out the dough to approx 1/2 inch thickness between 2 sheets of greaseproof paper. Use a square cookie cutter to form the base. Place on a non stick baking tray. Place raspberries & water into the microwave for 20 seconds at a time. Stir and mash in between each 20 second burst until the raspberries are softened, broken up and the mixture is steaming. 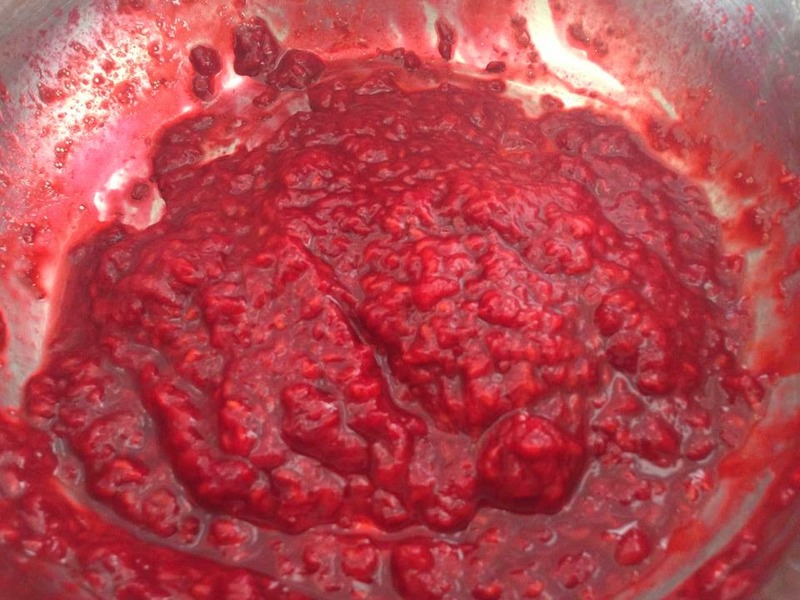 Sprinkle the gelatin powder over the hot raspberry mixture and set aside to dissolve. It's really important to pour the gelatin onto the liquid and not the other way around or you'll end up with a hard lump. Also make sure the liquid is steaming hot (not boiling) before adding the gelatin or it won't dissolve fully. Next add the egg whites, honey & vanilla to a heatproof bowl over gently simmering water. Whisk the mixture constantly until it forms stiff glossy peaks. (If you don't whisk constantly, you'll end up with scrambled egg whites). This should take about 5 minutes. At this stage, your gelatin should have dissolved, cooled and will be ready to use. It's important that both the gelatin mix & the egg white mixture are approx the same temperature, otherwise the gelatin will set too quickly and form strings... The egg white mixture will be warm, just make sure the gelatin has cooled sufficiently..
Add the gelatin mixture to the egg white gradually, whisking constantly. I recommend pouring the gelatin in a slow, steady stream. Once fully combined, you can stop whisking. Using a small piping nozzle, pipe a narrow line of the cooled raspberry jam down the centre of each biscuit base. Next using a medium sized star nozzle, pipe marshmallow on either size of the jam filling. Coat generously with dessicated coconut. Leave aside to set for 30 minutes before serving. Hi - we've now had Mikado and Coconut Creams - Kimberly on the way?? ?